Dragan Sekelja posted his first career double-double Monday night, but it went to waste. FAU lost to St. Francis 59-57 in the final minute of regulation after leading by as much as 11 points in the second half. Sekelja paced the Owls with a career-high 21 points and 12 rebounds, but it was an offensive mishap that handed FAU their first loss of the season. With the game tied at 54-54, Wayne Martin converted a layup with :32 seconds on the clock and gave St. Francis a two point lead. FAU moved the ball down the court with pace, but couldn't get off a clean look, as Jackson Trapp missed an off-balance jump shot. "We played well at times, but when you can put a team away, and you don't… it is going to hurt," coach Mike Jarvis said. FAU had two timeouts to call on the final possession, but elected to not talk it over. After shooting a barrage of long balls in the season opener, the Owls were just 1-of-8 from behind the arc. Jackson Trapp – who poured in 23 points against Ava Maria – was limited to just three points and found himself in foul trouble early. Pablo Bertone tried to compliment Sekelja with his shooting, but finished just 2-of-11 from the floor. "Pablo had an awful game because he was indecisive," Jarvis said. "Your jump shoot isn't always going to be there, you have to drive the ball." 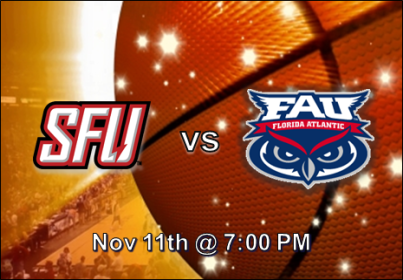 Sekelja led FAU with five assists, as the team turned the ball over 15 times. FAU (1-1) will travel to #4 Duke on Friday.